Bar towel features an embroidered drinking toast that would be at home in any Irish bar or kitchen. 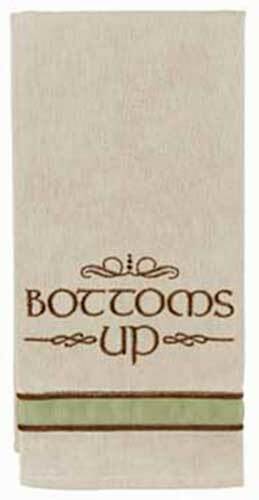 Bottoms Up is the featured drinking toast on this bar towel. Complement your Irish bar with this towel that features an embroidered drinking toast. The bar towel is made of 56% linen, 33% cotton and 11% rayon; it measures 14" wide x 19" long.